Free download Unlocker latest version. It is very useful system utility for your Windows based Personal Computer. Unlocker will help you to remove astute programs that are unable to remove. Sometimes, you have to restart your computer to delete such kind of program of folder. Unlocker is free application so you can download it from the given link below. After downloading, run the setup file and start to install it. It will require you to install some toolbar. If you will select Quick, then you will get delta search toolbar as a gift with this. If you don’t want this, then select Advanced option and uncheck the all options of this extra toolbar installation. After installation, your computer will be capable of remove all types of folders and files. This happen when you see and error message while try to delete folder. These messages can be as Cannot delete file: Access is denied, There has been a sharing violation, the source or destination file may be in use, the file is in use by another program or user, make sure the disk is not full or write-protected and that the file is not currently in use. When you see any of the given messages, you will need Unlocker to remove such kind of files. 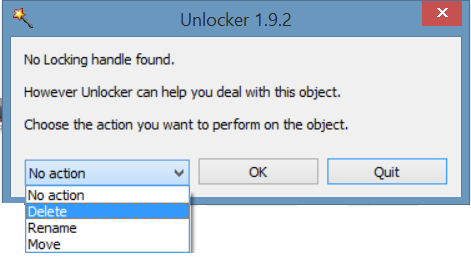 You can open unlocker using your windows search option (Win 8, 8.1) and search option from Start menu (Win 7, vista). Then explore the folder you want to delete and click on Ok. You will see some explorer process running and need to unlock all. Now you can take any action such as delete, move or rename. If the program is free then you will see the message no locking handle found.